Valentine is the only incorporated city in Jeff Davis County, Texas. It is located on U.S. Hwy 90. According to the 2000 census Valentine has a population of 187 people. Today Valentine is known mainly for its post office which receives an abundance of cards every year to be stamped and sent to Valentines all over the country. Valentine is also known for a little movie called “Dancer Texas, population 81” which was filmed there and the surrounding area in 1997. A building façade “Oasis Gas Station” remained on the deserted roadside until early 2005. 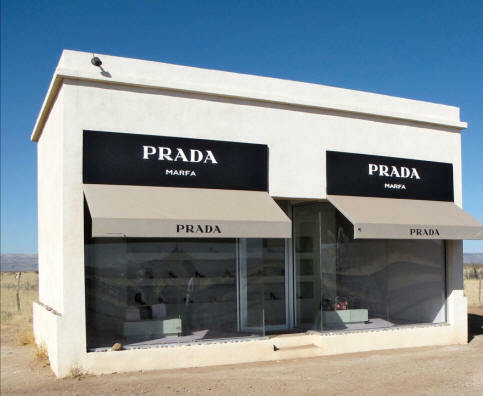 In 2005 a new building appeared west of Valentine on highway 90, Prada Marfa was erected as a work of art. Within its walls are shoes and other items from the fall 2005 Prada collection. In time the earth friendly building will decay and the display will become a ruin, but for now security alarms buzz at attempts to tamper with the “art”. Valentine recently constructed a memorial to the veterans which sits peacefully on the highway through town. Some say Valentine was named for Valentine’s Day when a railroad crew of the Southern Pacific Railroad laying tracks heading east from Van Horn stopped there on February 14th, 1882. Others believe Valentine was founded on December 23rd or 24th, of 1881 and named for John Valentine, President of Wells Fargo and a major stockholder in Southern Pacific. Valentine became a significant shipping point for the railroad because of it’s location between El Paso and Sanderson (Texas). Its location allowed railroad crews to lie over for a few days. In 1900 Valentine had two saloons, a butcher shop and a general store. Area ranchers shipped cattle out of Valentine but by the 1950s with the increase of trucks being used to haul cattle, Valentine’s railroad depot was closed down. At that point Valentine was no longer a thriving railroad community and the majority of the businesses closed down. At 5:40am on August 16, 1931 the largest earthquake known to have occurred in Texas took place near Valentine. All the buildings were damaged and even the tombstones in the local cemetery were rotated. Send your Valentine a Valentine from Valentine Texas!